Skincare - Fringe / A Salon Inc.
Now is the time to stop hiding from mirrors and worrying about your complexion before an important interview or date. Our skin care experts have the ability to restore and preserve your skin’s natural appearance and share with you the knowledge to further your results. We employ an in-depth skin analysis in order to address a variety of concerns such as acne, hyperpigmentation, dry skin and more. From there we will treat and help heal your skin by choosing products that target any issues you may have, as well as recommend items for an effective skincare regimen. Discover beautiful, radiant skin with one of our facial treatments offered at Fringe / A Salon Inc.
Purifying and pampering, Fringe facials are customized to meet your individual skin concerns. Enjoy cleansing, steam therapy, exfoliation, toning and facial massage. 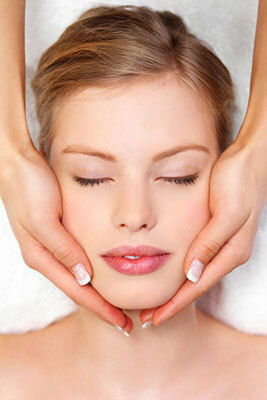 While skin soaks in a treatment masque, enjoy a tension releasing mini-massage. We offer many upgrades using innovative and advanced skin care technology for more targeted treatments. Glo chemical exfoliation treatment has the power to transform your skin. Beginning with a thorough consultation, each 30 minute treatment includes cleansing and prepping the skin, followed by chemical application which is neutralized and finished with a luxurious moisturizer. We also apply a light GloMinerals foundation with SPF sun protection. Microscopic diamond crystal exfoliation with our powerful microderm machine. This treatment focuses on removing the top layer of dead skin cells to reveal a soft, smooth skin texture without the use of chemicals or creams. You have to experience it to believe it!